I have an innate desire for all wildlife conservation. I can’t trace it back to a time where I didn’t have that inclination! Increasingly, our seas are suffering as a consequence of human activities and I feel a personal responsibility to work towards positive goals in the field as well as terrestrial environments, through my personal life as well as in work. My formal education was studying Medical Microbiology and Zoology at Leeds University, however I place great importance on my practical skills learnt in the field. Having an experienced wildlife watcher nurture my passion has been pivotal in my life and I can’t put a price on all I’ve learned in the company of others in the great outdoors! I became an active member of the conservation community in my local area. Arranging public events to spread awareness of marine conservation issues is probably what got me noticed, but also networking and volunteering for various organisations allowed me to show my strengths (and weaknesses!). I applied for a different role within the organisation which I was rejected for. A few months later, I became the line-manager of that very role, so don’t let set-backs get you down! 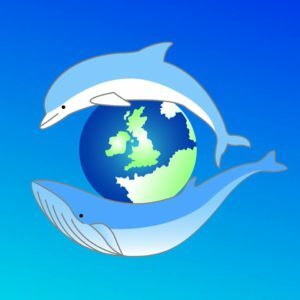 I really love having people share their experiences of cetaceans around the UK with me. I can feel their excitement, even through our online sightings form and it’s a great part of today’s social media society that folks can share their experiences with so many other people, including research groups like Sea Watch. 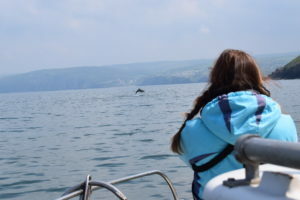 Sometimes, working in New Quay with such regular dolphin sightings, I’m ashamed to say that I get blasé about seeing dolphins. As soon as I get outside and that pane of glass has disappeared between us, I am as excitable as the next person again! Taking part in photo-identification surveys with bow-riding bottlenose dolphins, bringing their calves over, whistling, looking at you and breaching is something that I feel so privileged to take part in. After an encounter like this, I am euphoric! I am proud to help steer the scheme and want it to be as successful as possible. The importance of networking and volunteering. Having applied field skills and showing who you are to potential employers is so important to breaking through the barriers of job applications. Get involved. You don’t need to be employed to make a difference; start now, volunteer, create change. You’ll do some good and it might even get you noticed in the world of employment. I am terrible at choosing favourites! I’m going to go for something that I have not yet had the privilege of seeing for myself… the pilot whale! I think they’re adorable. I love that they have such strong social bonds and it will be a good day if we can ever work out to prevent mass strandings. 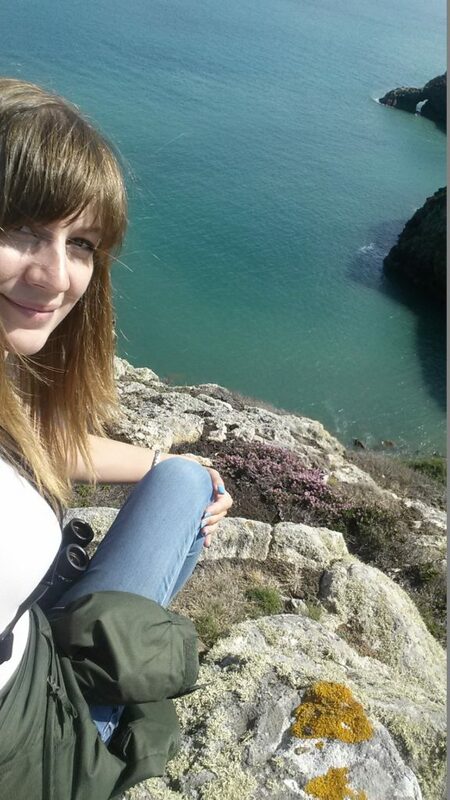 Learning to scuba dive off the coast of Cornwall was quite literally an eye opener for me. To see such incredible, colourful and diverse life under the water and just metres from the beach was something I hadn’t expected. I remember coming face to face with a cuttlefish and as we considered each other I was transported to another world. Yet again, I’m not satisfied to choose just one moment. The sea has provided so many moments of joy to me and I know it will continue to do so! Thanks for the great advice Kathy! Sea Watch Foundation have great internship opportunities and are recruiting now for 2018! Follow Kathy’s advice and get involved.